In medium bowl, mix crushed cereal and brown sugar with fork. Stir in melted butter until well mixed. Press in bottom and up side of ungreased 9-inch pie plate. Bake 8 to 10 minutes or until golden brown. Cool completely, about 30 minutes. Meanwhile, in large bowl, beat cream cheese with electric mixer on medium speed until smooth. Beat in granulated sugar. Add sour cream, vanilla, lemon peel and lemon juice; beat until well mixed. Fold in whipped topping. Refrigerate until ready to fill pie. Spread filling evenly into fully cooled crust. Cover and refrigerate 4 hours to set. 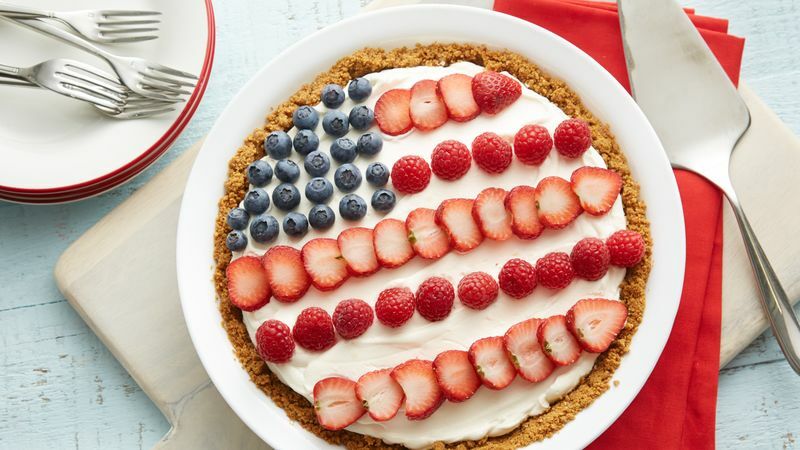 For flag design, arrange blueberries in upper left area of pie to create stars; alternately arrange raspberries and strawberry slices in rows over pie to create stripes. Serve immediately. Store covered in refrigerator. Folding whipped topping into the filling keeps it light and fluffy. A rubber spatula works best for folding. Use an offset spatula to smooth top of cheesecake filling, if desired.